The master groomers at Suzie's Place have been doing what they do best for decades! They have not only the skills to create a beautifully groomed pet, but the experience to handle your pet properly. We pride ourselves in being a cruelty-free grooming salon. Not only do we use the utmost compassion in handling your pet, but we also only use or sell products that are cruelty-free. At Suzie's Place, we aim to give back to others by being involved in community service activities that extend beyond grooming. Want to learn more? Click here to see what we are involved in! 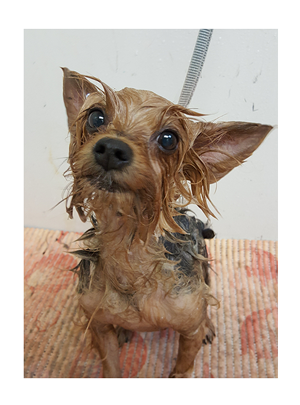 We use only the most gentle, natural shampoos and conditioners to keep your pet clean and comfortable. No one likes walking around with long, sharp nails. Getting a quick nail trim and file is easy and painless. We provide a wide range of professional grooming for any breed. We also offer hand stripping. Want to show off your pet's personality? With a variety of fun colors and imaginative ideas, the possibilities are endless. Just need a quick touch up in between groomings? A "tidy up" includes pad trimming, nails, and sanitary trimming. We offer many other services, from hand-stripping to teeth brushing, and more! and Ft. Lauderdale since 1988. Our grooming is pet centered and your pet's comfort is our main concern. We understand you want the best for your pet. When you drop your pet off to be groomed it is important to feel that your pet is in the hands of professionals with years of experience. Rest assured that the professional pet groomers at Suzie's Place have been doing what they do best for decades. We don't require that you drop your pet off in the morning and wait all day to pick them up! We like to work with you and your pet so that is why we are in favor of appointment times that work best for you and your pet! Suzie has always had a deep love an affection for all animals and started working with animals as a veterinary assistant in the early 80s. She decided that would give her the opportunity to be surrounded by animals daily. "I found that I had an ability to make the animals feel at east with me, and therefore grooming them seemed like a perfect profession. They would get the grooming they need and not be stressed because they could sense I would take good care of them," Suzie says as she reflects on what brought her into the pet grooming industry. Suzie has used that understanding of animals to provide behavior counseling to people for their pet as well. She has found that understanding pets needs and why they behave the way they do is a critical element to grooming them. "The first thing you have to do is make them comfortable on your grooming table, so then you can make them even more beautiful!" After nearly 30 years of grooming dogs and cats her business philosophy is "pay attention to the pet on your grooming table and your business will always be good!" After graduating from grooming school in 2015, she went on to work as a groomer at Petco and soon realized she wanted to perfect her grooming skills and to become a Master Groomer. She came to Suzie’s Place in June of 2017 and Suzie was immediately impressed by her clear love of animals and dedication to her craft. Erin’s love for animals has been lifelong. At an early age, she realized that animals really need and deserve quality care and upkeep and wanted to get into a profession that would allow her to serve the animals. Have a question for Suzie?